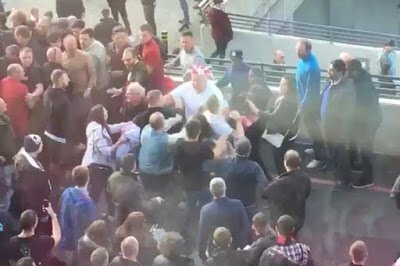 Fans of Arsenal and Manchester City were involved in violent clashes as they left Wembley on Sunday. 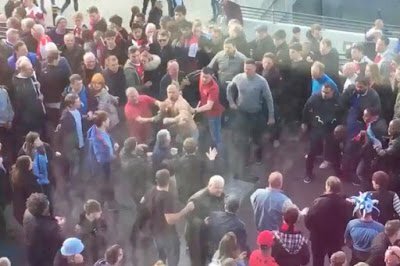 Fighting broke out as supporters walked out of the national stadium following the FA Cup semi-final, with the shameful scenes being caught on camera. 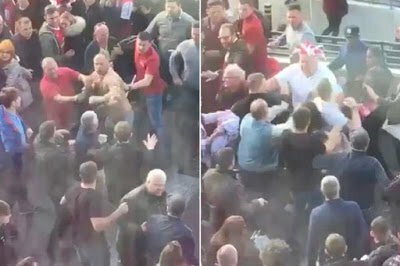 Punches were thrown between the rival sets of fans, while others were seen rushing away from the incident. The fighting, which was filmed by Gooner News TV , appeared to die down as other fans intervened and pulled people away. Some fans appeared trapped and were unable to get away from the violence due to the sheer masses of people that were leaving the stadium. Fans were leaving Wembley after Arsenal secured their place in the final of this season’s FA Cup, where they will take on Chelsea. The Gunners came from behind to secure an extra-time win, with Alexis Sanchez netting the winner in the 101st minute. Nacho Monreal had brought Arsenal level as the game entered the latter stages of the initial 90, cancelling out Sergio Aguero’s opener.